Can You Still Get The $7,500 Tax Credit On A Tesla Model 3? Maybe. It’s Complicated! Did you know that the $7,500 federal tax credit for electric vehicles is going away for Tesla? Yes, the company sold its 200,000th car in July of this year, and we covered here and here that the full credit starts phasing out on January 1st, 2019, by being cut in half to $3,750. After that, there is a cut in half again to $1,875 on July 1st, 2019, and then the credit is fully eliminated (for Tesla) on January 1st, 2020, as shown on the chart below. 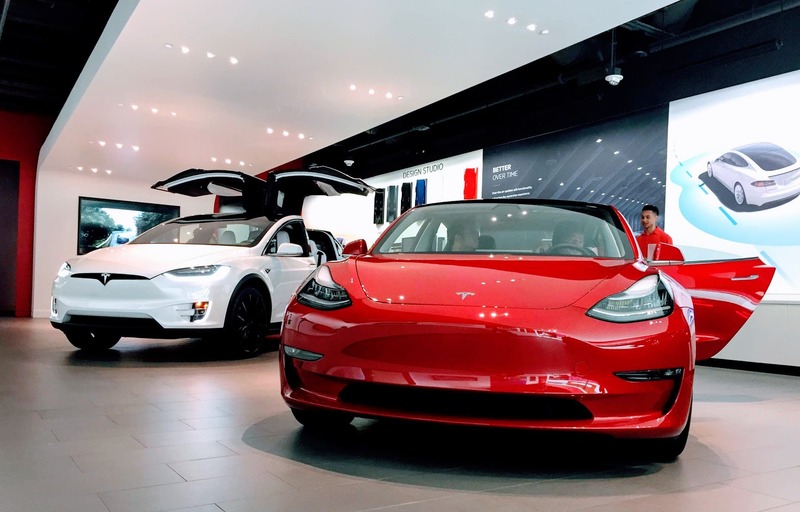 Many people who have been waiting for the $35,000 Tesla Model 3 are coming to the conclusion that it may not be available for a while and maybe they should buy one of the models that is available now to take advantage of the tax credit, the fuel savings, and the fun this year. In addition, the resale value of a car with a larger battery and the premium interior should also be enhanced. So … you should have ordered a Model 3 about a month ago to ensure you could get the full tax credit by getting the car delivered by December 31st, 2018. If you are still reading this, however, it probably means you didn’t order your Model 3 yet, but now want to find a way to get one this year. The purpose of this article is to explain the 5 ways you might still be able to pull it off. I should also mention that you need to ensure you have sufficient income to take the full tax credit. This NerdWallet article does a pretty good job of explaining the tax credit and you need to spend some time plugging in your income numbers into a calculator like this or have your tax advisor help you. Basically you need about $65,000 to $90,000 in income a year (depending mainly on your filing status) to owe enough taxes to take the full credit. When you can get a lease on a Model 3 (maybe 2019 or 2020), you may be able to get the leasing company to take the tax credit and pass the benefit on to your monthly. Of course, if leases aren’t available till 2020, the tax credit will be gone (unless extended, see below). 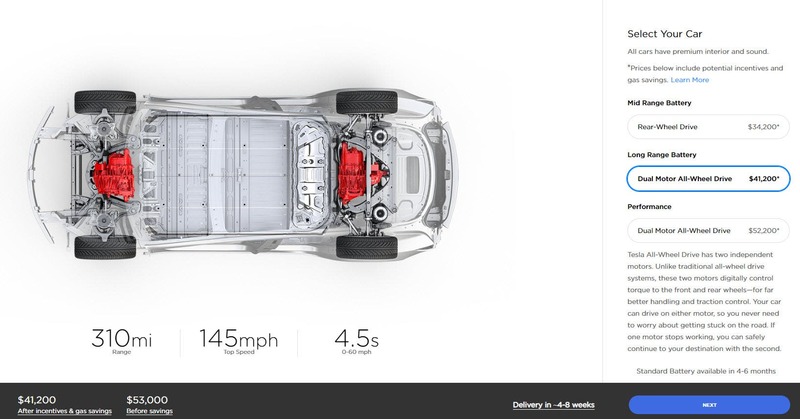 Tesla Design Studio shows availability as 6 to 10 weeks. The advantage is you get the exact car you want. The disadvantage is you might not get the car by December 31st and might miss out on the full tax credit. I would pick this option if I lived on the West Coast and was comfortable with the risk that I might not get the full credit. The Tesla Design Studio shows availability as 4 to 8 weeks. The advantage is you get the exact car you want and you have a better chance of getting these models by year end than the new Mid Range Battery model. The disadvantage is the Long Range option starts at $53,000 and you still might not get it by year end and might miss out on the full tax credit. I would pick this option if I lived on the West Coast or Midwest, wanted a bigger battery or better performance, and was comfortable with the risk that I might not get the full credit. 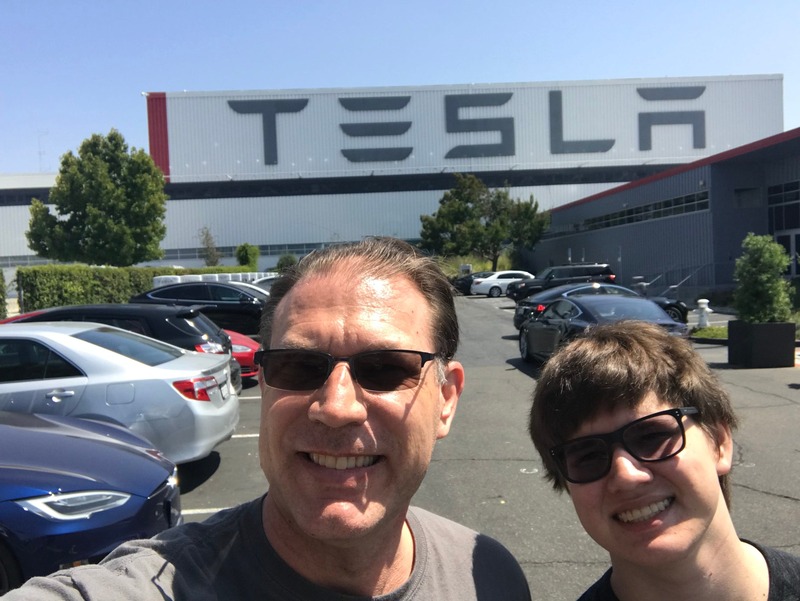 My son (Matthew Fosse) and I visit the Fremont factory! You have to pay California sales tax (your state may or may not credit you that amount off of your state’s tax). Travel costs and missing work to go to Fremont. There are frequently delivery delays. If you pick this option, I recommend you call the Fremont sales center at 510.249.3500. You can request the car be delivered to you in your city (Tampa in my case) and if you get to December 10th and it looks like you aren’t going to get the car to your home by December 31st, work with the your Fremont delivery specialist to change delivery to the factory (where the delivery times are much quicker). I would pick this option if I lived within driving distance of Fremont or I was retired or I had a very flexible work schedule. When I called the Tampa office, there were several inventory cars available. The advantage is you get a car within days and are assured to get the full tax credit. The disadvantage is you may not get the options or colors you want. If the car has Autopilot on it and you don’t want it, they can remove it and save $5,000 (although I don’t recommend you order a Model 3 without it). Some cars required an extra $1,000 delivery fee on top of the destination charges everyone pays. I would check on this option and take it if the cars met my needs. When I called the Tampa office, there were several demonstration cars available for sale. The advantage is you get a car within days, you get a full warranty, you get a few thousand dollars off the price, and you are assured to get the full tax credit. The disadvantage is you may not get the options or colors you want and you may not like that the car has been driven hard for a few miles. Again, some cars required an extra $1,000 delivery fee on top of the destination charges everyone pays. I’ve presented 5 ways to possibly get the full tax credit on the Tesla Model 3. You may not like any of them, but since I was researching all the alternatives for a friend, I thought I would document what I found to help CleanTechnica readers. The best answer is to get in a time machine and order what you want a month ago, but for those without access to a time machine, I tried to give you some alternatives!